The Usergrid data store is backed by Cassandra, an open source distributed DBMS. Cassandra is specifically designed to support applications that need flexibility and high scalability, particularly web and mobile applications. To get the most out of your Usergrid application, you should optimize your data access with this kind of database in mind. The best practices described here are all related to the theme of putting your data in the way you’ll want to get it out. You’ll model your data with your likely read requests in mind rather than by modeling around the structure of the data itself (as you might with a relational database). In many cases, you can avoid using queries that are inefficient for this kind of database. Denormalize and duplicate. By creating a data model that strategically denormalizes and duplicates data, you can avoid costly queries. In other words, you model the data so that all of the data for a given request is all in one place rather than scattered in a way that a query must account for. Create direct paths to the data you’ll want. You can optimize your app’s performance by connecting entities your code retrieves most often. With connections, you can avoid some queries that might add complexity and reduce performance. If you’re familiar with designing relational databases, you’re probably used to normalizing the structure of your data as much as possible. When normalizing an RDBMS data model, you minimize redundancy by ensuring that a column from one table is duplicated only once in any other table, and only when necessary to create primary/secondary key relationships. You then retrieve data that spans tables by joining them with an SQL query. In contrast, with the Usergrid data store you’ll get better performance by strategically denormalizing and duplicating data. When you denormalize, you combine data from what might (in a relational model) have been separate tables. When duplicating, you intentionally maintain copies of certain entity properties across multiple entities. By denormalizing and duplicating, you can collect the results of requests into a single entity rather than relying on a query. Part of designing your data model should include identifying the queries your client will make. Then in your data model design, you capture the results of those queries in advance by writing that data into entities of one collection you can read from later. For example, take a closer look at the relational case through a product database. Imagine you want to present a list of all reviews for a product. When a user chooses a review from the list, you’ll show them a view that includes the review’s title, body, and rating; the product it describes; and who wrote the review. That way, your user will be able to click through to more information about the product or reviewing user. To get the data you need, your query might look like the SQL query below. By getting UUIDs for the user and product into your client code, you’re able to give the user a way to get user and product information from the review. But due to Cassandra’s distributed, high-scale design, a join such as this wouldn’t work. So in the Usergrid, you’d get the data by first storing it all in one place. 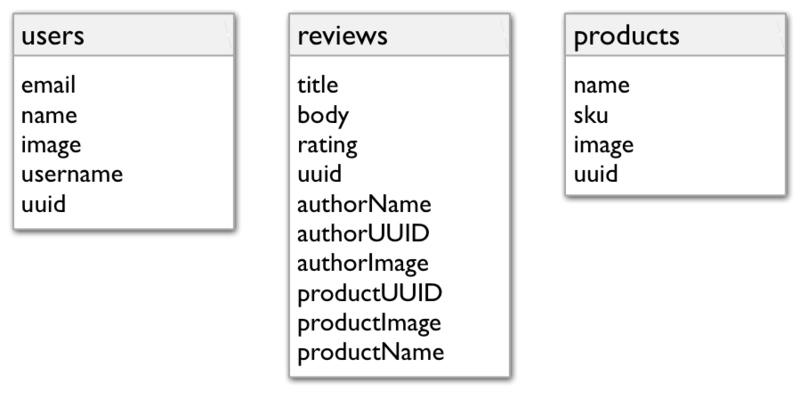 In the Usergrid, a more efficient way to get the same result would start by including related user and product data with the review data. This would give you a single place to get all the data you’ll show. This use case assumes that your user and product data are already in the data store. In the following API request code, you’re just adding a new review written by a user about a particular product. The JSON body is your new review entity (the JSON here is non-entitized to make it readable). "productName" : "Magic Castle Bounce House Inflatable Bouncer"
Notice that you’re adding user and product data (which your client code would have at hand when the user posts the review) when you’re adding the review-specific data. Your result might look like this. The highlighted lines show data you’d present to the user. "title" : "Tempted to climb in myself." This gives you, in one request, all the review information you’d planned on presenting to your app’s users for a single view. Your client code could retrieve the review entity in the result, along with the product and user data, then present it all as a review. Best practice: Connect entities to simplify scoped requests Another way to streamline your requests is to connect entities by using the built-in connections feature. In a sense, a connection can replace the WHERE clause of a query you might have written. But if this is an API call you’re going to be making often, there’s a better way. Instead, create a connection between the review and the user when your code creates the review. You can connect entities with a verb that describes their relationship to one another. Your request result would look something like the following. Here, the entities array returned contains the reviews you connected with Jennie (though there’s only one in this example). The connection-specific metadata is highlighted. You can create connections to set up relationships you can use to later retrieve data quickly and with a simple syntax.